A matrix organizational structure is a complex structure, in which the reporting relationships are set up as a grid or matrix. It is used mainly in the management of large projects or product development processes. A smaller company, or one with few levels of middle management, might have a more organic structure — there is a shared knowledge base and centralized decision making; all parts of the workforce have common interaction with each other. But in a larger company made up of various divisions and teams, who may have only brief interactions and essentially work independently from each other, it is crucial to have a structure in place that clearly defines the decision making and supervisory process. The ability to create a matrix organizational chart is supported by ConceptDraw's Solution Park. The 25 Typical Orgcharts solution is a paid add-on for ConceptDraw DIAGRAM, that provides you with the opportunity to develop organizational charts quickly and easily, at an economical price. Select the “Matrix Organizational Chart” template in the Solutions panel . The Action button allows you to easily add rows and columns, and then equalize them. Click the shape to which you want to add a description and then enter the text. 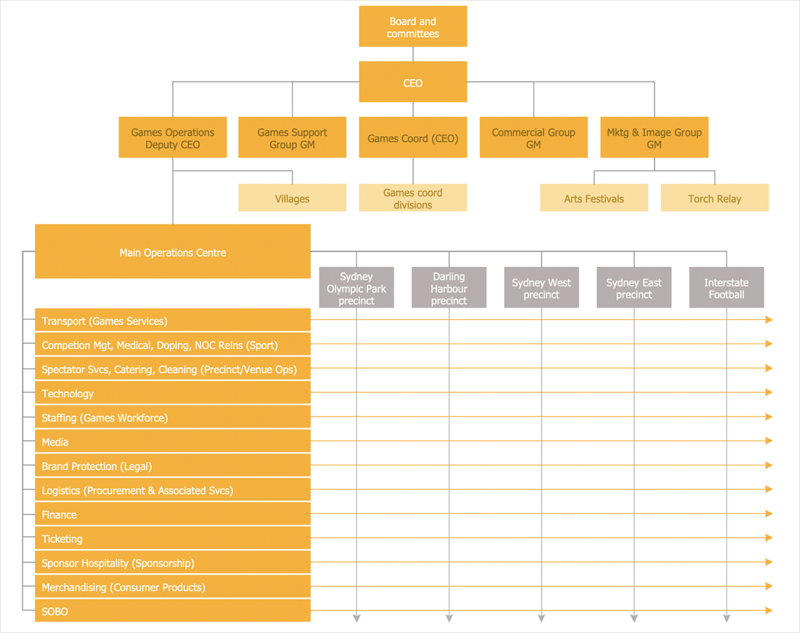 You can combine different types of orgcharts in one document. Add the appropriate objects from the library. To connect objects, use the Smart Connectors. Result: Using a matrix organizational structure can help to implement an efficient exchange of information within an organization. Organizational Charts, Fishbone Diagrams, Timelines.